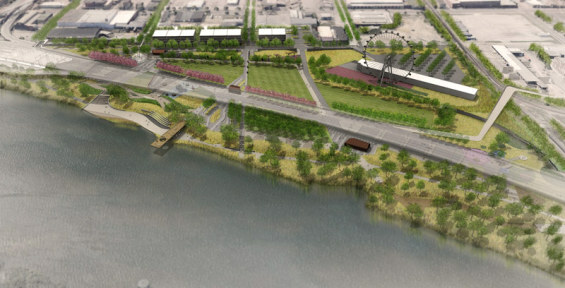 Building upon the success of Louisville’s Waterfront Park (Phases 1-3), Phase 4 is intended to be the westward expansion of open space along the downtown banks of the Ohio River. 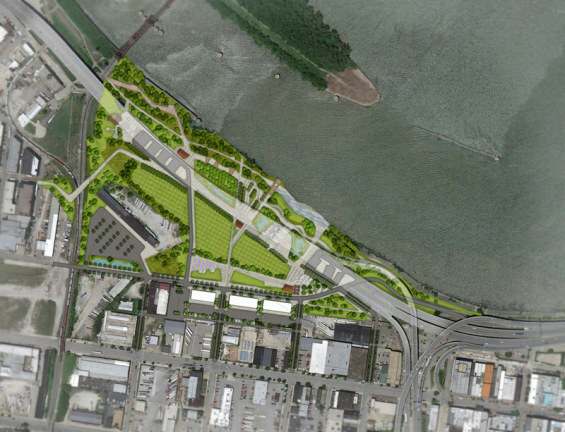 The 22 acre site serves as a continuation of community open space along the Ohio River corridor, connecting the downtown core with Portland Neighborhood and West Louisville to the west of the park. 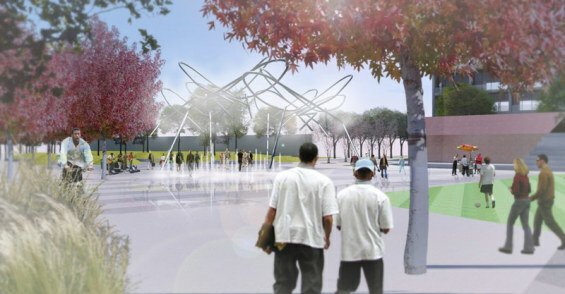 Building upon the principles and goals of the original Waterfront Park Phase 1-3 Master Plan published in 1991, this master plan identifies key park rules of form and overall development structure to allow both an understanding of the park as a total framework and of individual spaces within that framework. Understanding the park as a series of spaces or rooms, this master plan provides detailed recommendations for the enhancement and completion of each space in achieving both quantity and quality goals for the park. 1. Fort-on-Shore – Built in 1778, this settlement was located at the intersection of 12th and Rowan Streets. It is considered the first on-shore settlement along the Ohio River bank within the area that now considered downtown Louisville. 2. Louisville and Portland Canal – This 2-mile long canal was constructed originally in the 1830’s and was modernized in the early 1960’s. At the time it was constructed, the canal project employed nearly 10% of the population of Louisville, and took 5 years to complete. 3. Ornamental Steel Foundries – Throughout the 1800’s and early 1900’s, the site and surrounding areas were home to several steel foundries that formed the ornamental steel shipped down the Ohio River from cities in the northeast. 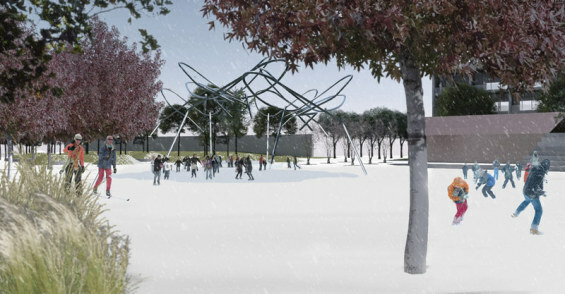 Steel sculpted in this area can be traced to locations across the globe, including: library stacks in the Vatican, large portion of the historic French Quarter facades, steps within the St. Louis Arch, and portions of the Eiffel tower. 4. Tobacco Breaks – The core of Main Street between 10th and 14th Streets was historically lined with tobacco warehouses during the 1930’s. At the height of production, this area of Louisville was responsible for the production of nearly 1 billion cigarettes. 5. 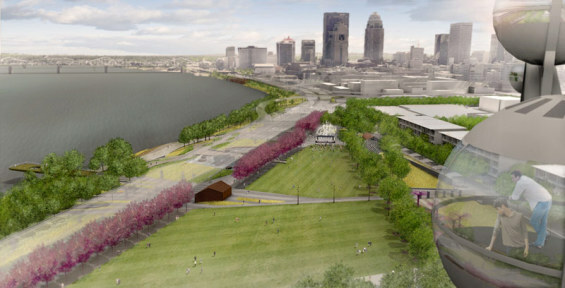 Flooding – Louisville’s relationship with the Ohio River has been on of both progress and retrogress. Although Louisville has seen periodic flooding throughout the years, the floods of 1937 forever changed the course of development within the river corridor. 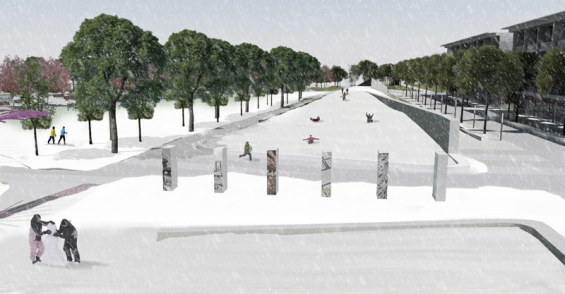 After 18 inches of rain in 16 days, the 1937 Flood resulted in the development and construction of the levee and floodwall system (1950) that currently meanders along the banks of the river corridor through downtown Louisville and along the edges of the Waterfront Park Phase 4 study area. The design team explored the seam/overlap between these biomes, and applied the term Ecotone to define these transitions. In ecological terms, an ecotone is defined as a transition area between two biomes, where two communities meet and integrate. An ecotone may appear as a gradual blending of two communities across a broad area, or it may manifest itself as a shared boundary line. Borrowing this ecological term, the Phase IV site presented itself as three distinct conditions or biomes: Urban, Park, and River. At first glance, this may appear as an acceptable and logical sequence of spaces for the park. 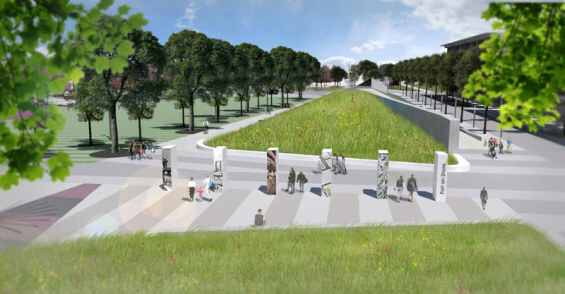 However, the Design Team decided early in the process to challenge this notion, and envision a park that attempts to weave the the qualities inherent to each biome, dissolving the static boundaries that partition the site. 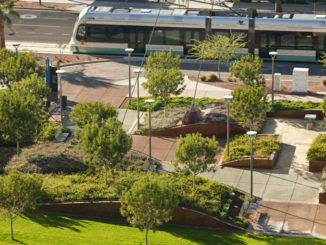 Much like the ecotone found in a natural setting, now the park promotes a new and unique condition found between the seams, embracing the tension and promoting a conversation between Urban, Park, and River.